Syngenta Technical Manager, Glenn Kirby, reviews some of the latest turf spray application research, to achieve better coverage with contact fungicides. Spray techniques could have a huge influence in achieving good surface coverage with all products. It is especially important with contact fungicides, where consistent coverage of the leaf surface is crucial to keep out microscopic disease spores. Furthermore, spray drift can have a significant effect on the efficacy of any treatment. And with golf and amenity operators under close public scrutiny, there is an important industry initiative to keep spraying clean and on target. Droplet spectrum of a nozzle makes a significant difference, for both hitting the target and leaf retention and coverage. As a rule, smaller droplets give greater coverage, but are more susceptible to serious issues of drift and loss – trials have shown up to 15% of fine droplets may never even reach the target surface. Typically larger droplets are far better at hitting the target, but may require help through product formulation and adjuvant use to achieve desired retention on the leaf and achieve good coverage. The advent of air injection technology – as incorporated in Syngenta XC Nozzle Technology – creates a bubble of air in every droplet – which ensures that more spray reaches the target and is retained on the leaf. The step-change advance with XC Nozzles is that they produce up to seven times more droplets per ml, compared to some other ai nozzles, to ensure better coverage. 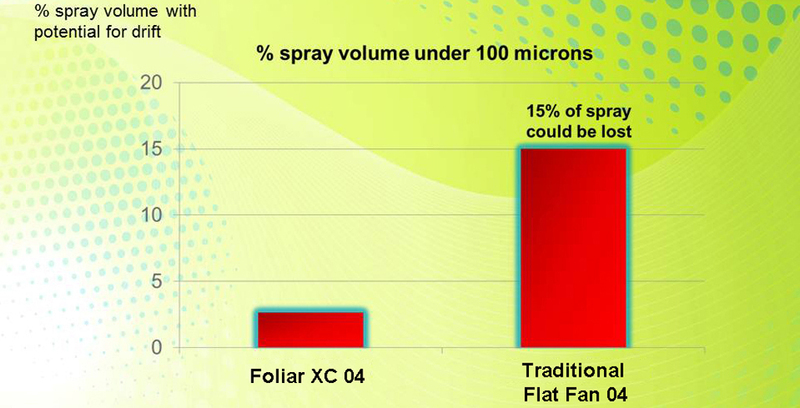 Research into spray patterns has shown a standard 04 flat fan nozzles produces around 15% of sub 100 micron droplets that are most susceptible to drift, compared to less than 3% with a red XC Foliar 04 (above). Water volume also impacts upon spray quality and leaf coverage; you need sufficient water to help spread the product across the surface. But avoiding too much that will over wet the leaf and break the surface tension, leading to run-off and loss. Even small changes of a gusty wind during spraying could disrupt the spray pattern along the boom – leading to potential under dosing that could leave areas less protected against infection. Syngenta application research under ‘perfect’ spraying conditions – with a wind speed averaging 1 metre per second – revealed changes from 0 to 6 m/sec over a two-hour application window, and a direct correlation in the efficacy of control in the trial. Operators can minimise the effects of spray pattern disruption and drift by maintaining the boom height at a consistent 50 cm and keeping it level as far as possible; slowing down to minimise turbulence of air behind the sprayer and using low drift nozzles, such as the Syngenta XC Nozzle range. The XC Nozzles are specifically designed for turf application to give greater flexibility in maintaining a consistent spray pattern over uneven ground, often encountered driving up or down slopes or on McKenzie style greens. With standard nozzles any deviation from the optimal 50 cm boom height will severely impact upon the spray pattern at the surface. Trials have shown that if a boom dips to 30 cm, the result with a flat fan nozzle would be over 25% change spray deposition between the nozzles (above). With an XC Nozzle the spray pattern remains far more consistent if the boom height drops to 30 cm, or rises to 70 cm. STRI research into application techniques with Medallion TL for Microdochium (Fusarium) Patch showed the XC Nozzles performed equally well for disease control at nozzle heights of 30 cm and 50 cm. To further enhance coverage with contact fungicides, Syngenta research has shown that an angled spray pattern - designed into the XC Nozzle - can help to counteract the forward movement of the sprayer to give better all-round coverage of an upright turf leaf. It may only be a small enhancement on a short turf leaf in a dense green sward, but where the intention is to prevent microscopic spore growth from getting in, every incremental advance helps. 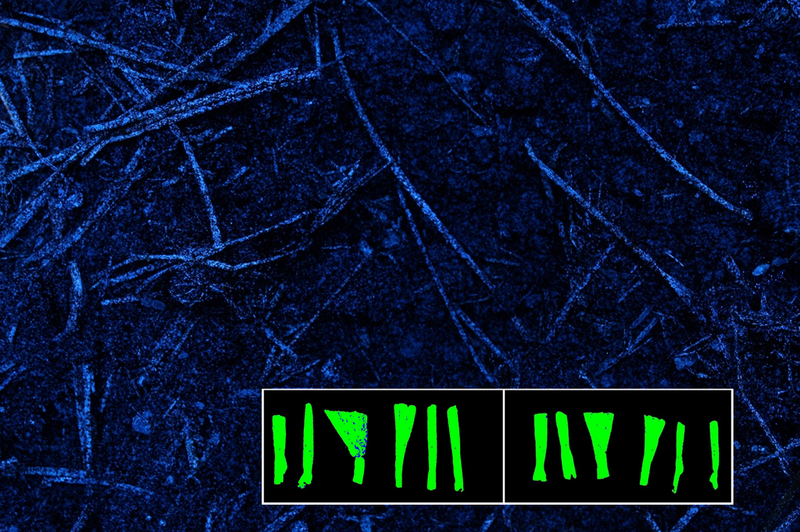 Now, using new ultrafluorogenic detection techniques, Syngenta researchers and dedicated application specialist can better identify how and where spray patterns are deposited on the leaf or surface – to a magnitude of an 11,000-fold enhancement in the visual spectrum (below). Furthermore, the techniques give almost instantaneous results to assess practical solutions to improve future spray targeting and accuracy. Along with the spray physically hitting the leaf, the formulation of any product will influence how it spreads and stays on the surface. In high quality Syngenta formulations, a blend of surfactants and adjuvants are designed, among other functions, to keep the active suspended in the spray mix, to hold the spray on the leaf and to help achieve an even surface coverage. 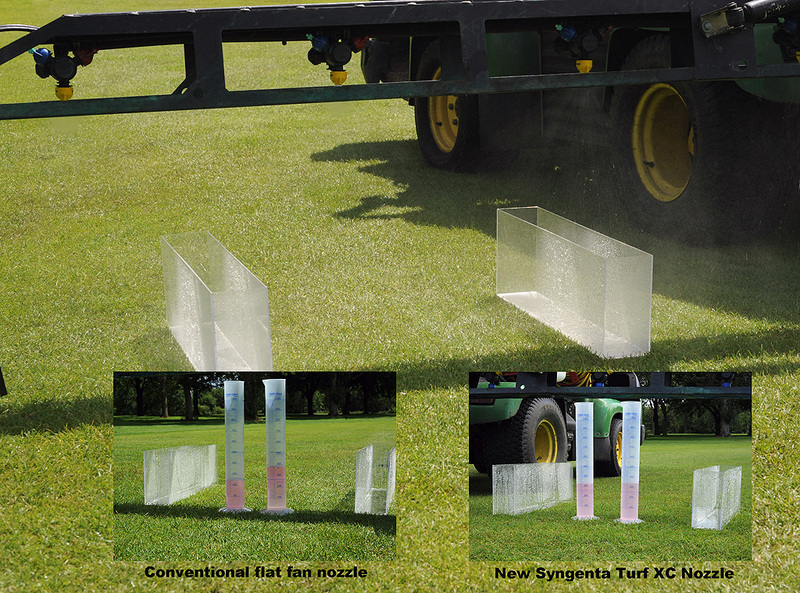 New Syngenta turf research is evaluating how formulation and tank-mix technology can further help to reduce the risk of spray drift during application, enhance retention and coverage on the leaf and cost-effectively improve results.